Surprisingly easy to make, Roasted Rack of Lamb with Garlic and Herbs is an impressive, crowd-pleasing main-dish full of herbaceous deliciousness. Traditionally served at Easter, this lamb recipe has the best of everything. 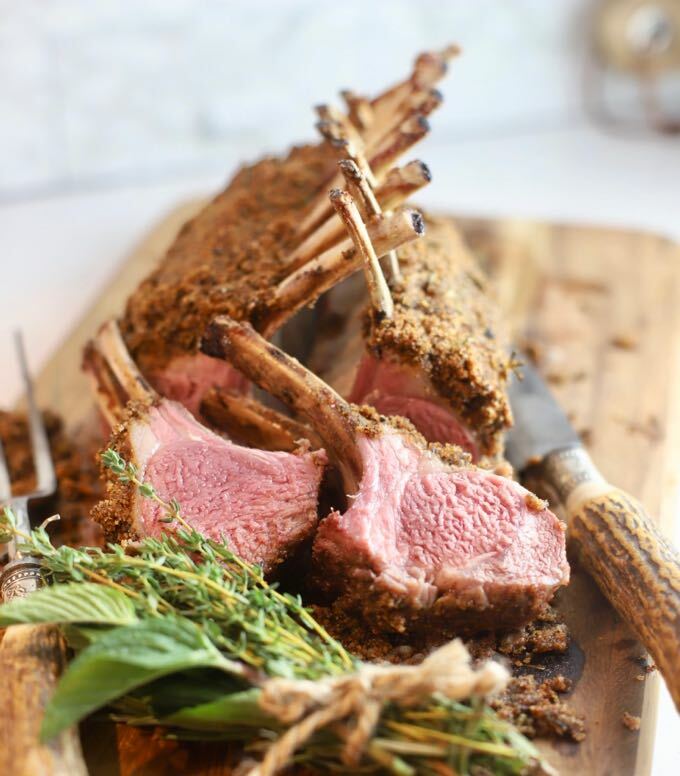 This outstanding rack of lamb recipe is courtesy of our good friend, Fred Crawford. When Fred found out I had never cooked lamb, he graciously volunteered to come over and teach me how to prepare this incredible dish. And, now I am sharing his classic recipe with you! For some reason, I have always been a little afraid of cooking lamb. To be truthful, I had only tasted it once before. Lamb has never been on my radar. And, not only did I not know how to cook it, I didn’t think I would like it. Wrong! What does rack of lamb taste like? Lamb has a very delicate flavor which is enhanced with the fresh rosemary, garlic, and thyme in this recipe. It’s also as tender and juicy as the finest steak and is delicious in an unforgettable way. 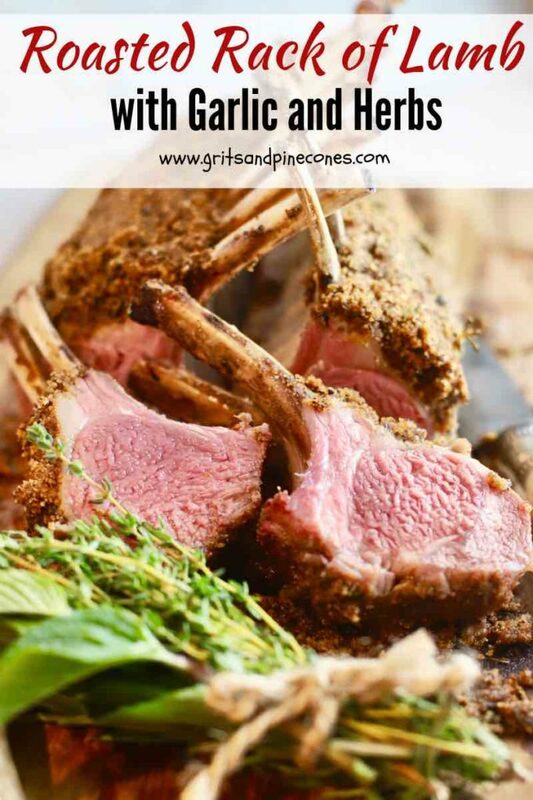 Rack of lamb is great for special occasions. But, this restaurant quality dish is also perfect for just about any event. From dinner parties with friends to weeknight dinners with the family, this dish is sure to please. I served our rack of lamb with Parmesan Potatoes Au Gratin and a mixed green salad. Other side dishes which would pair nicely with the lamb include Southern Cheesy Scalloped Potatoes, Baked Mac and Cheese, and Cheesy Cauliflower Gratin. Need more inspiration, click here for all of my side dish recipes. Need more ideas for Easter dinner sides, check out this post of 33 simple vegetable sides: Easter Dinner Side Dish Menu Ideas and Recipes. 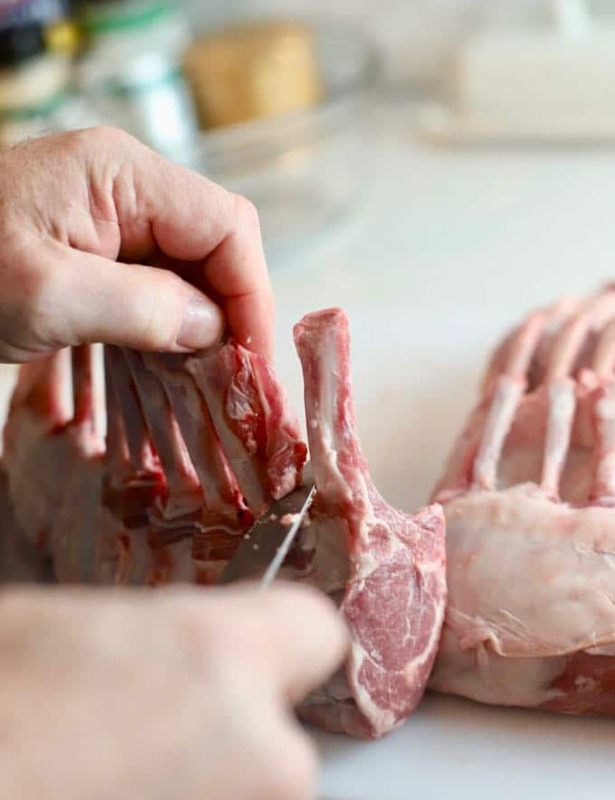 Most racks of lamb are already frenched when you buy them, which just means the meat and fat have been scraped off of the top 2-inches of the bones. Your butcher should be happy to do it for you. If not, check out this link to a video by Gordon Ramsey for instructions. 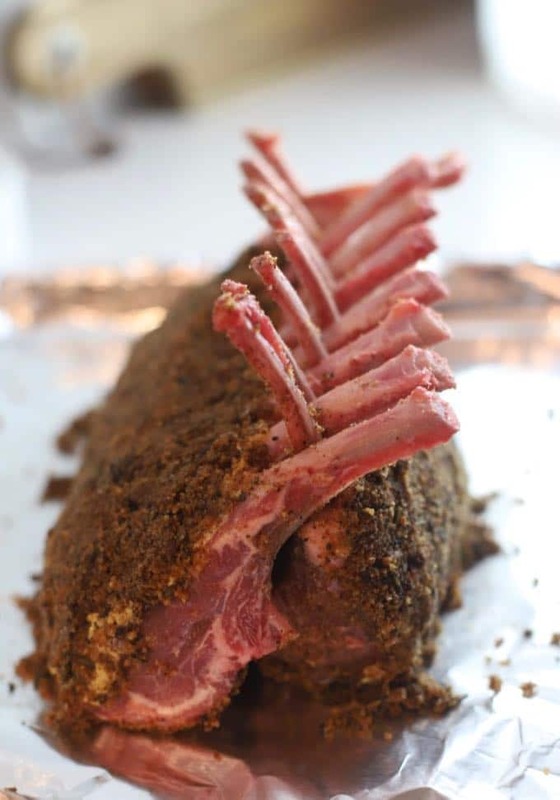 Season the undersides of the lamb racks with about one teaspoon of kosher salt, garlic powder, and onion powder and one-half teaspoon of pepper. 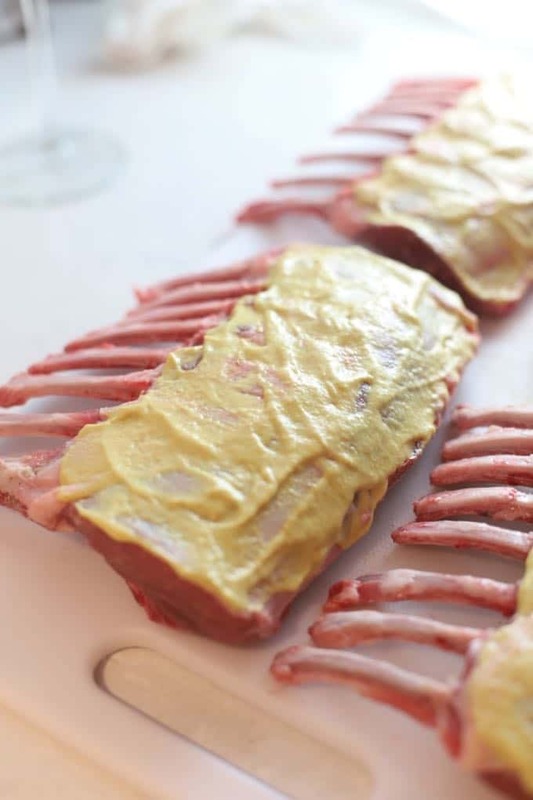 Evenly baste the top side of each of the racks of lamb with about one tablespoon of dijon mustard. Divide the garlic and sprinkle evenly over the mustard. Set aside. Melt about 3/4 cup of the butter in a large skillet over medium-low heat. Add the bread crumbs and stir to combine. The bread crumb mixture should have enough butter so that it will hold together and can be packed on the lamb. You should be able to take some in your hand and it should hold together when you squeeze it. If it seems too crumbly, add the rest of the butter. Add the rosemary, thyme, garlic powder, onion powder, kosher salt, and pepper. Mix well. Taste the bread crumb mixture and add additional salt, pepper, garlic, and onion powder, if needed. Let the bread crumb mixture cool until you can handle it and carefully pack it on top of the mustard and garlic covered racks. Liberally pile it on and keep packing it down. You shouldn’t have but a tiny bit of bread crumb mixture left. Line a baking sheet with aluminum foil. Take two of the racks and stand them up on the baking sheet. Tilt the bones toward each other and interlock them. Repeat with the other two racks. Roast in the oven for about 25-35 minutes. At about 20 minutes start testing for doneness with an instant-read meat thermometer. Stick the probe in the thickest part of the meat not touching any bone. Temperatures for lamb are 120 degrees for rare, 125 degrees for medium-rare, 135 degrees for medium and 145 degrees for medium-well. When the lamb is done, remove from the oven and let rest for a few minutes. To serve, slice the racks into individual chops with one or two bones each. 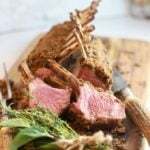 For step-by-step instructions showing how to “french” a rack of lamb, check out this video with Gordon Ramsey. Dried herbs have a much more concentrated flavor than fresh. If you are substituting dried herbs for fresh, only use 1/2 as much of the dried. The estimate for eight servings for this recipe assumes that each person will have four bones. That is two thicker chops with two bones each or four thinner chops with one bone each. Depending on the number of sides and whether your guests are big eaters, you may want to add another two racks. 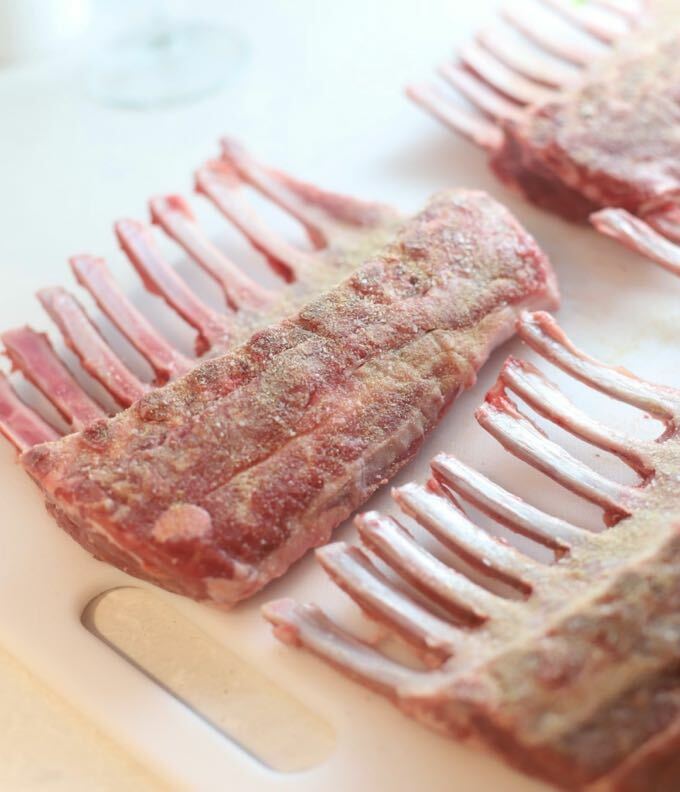 Most racks of lamb are sold two racks to a package and are approximately 2 pounds. Racks of lamb can vary in size. If your racks are much over or under one pound each it will take longer or less time, accordingly, to cook them. To ensure they are cooked to the proper temperature use a meat thermometer. You can substitute salted butter for unsalted butter, but if you do, cut back on the amount of salt in the recipe. 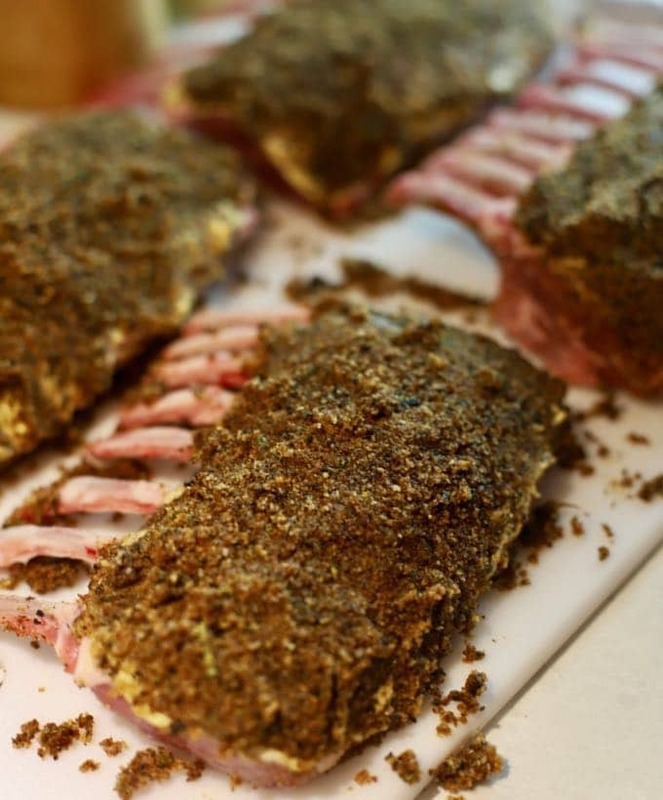 To make ahead, prepare the rack of lamb up to the point of adding the bread crumb topping. Cover and refrigerate for up to 24 hours. To bake, remove from the refrigerator about 30 minutes prior to baking to allow the meat to come to room temperature. Bake as directed. 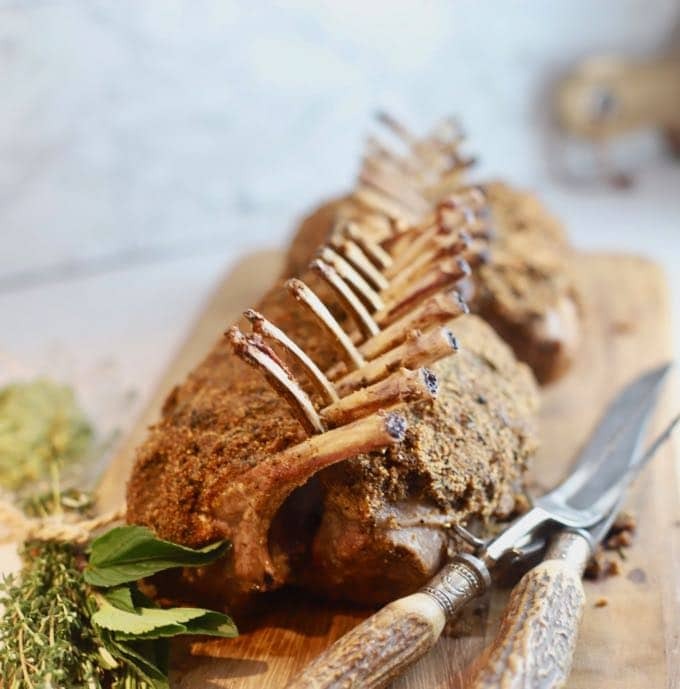 Most racks of lamb are already frenched when you buy them, which just means the meat and fat have been scraped off of the top 2-inches of the bones. Your butcher will be happy to do it for you. If not, check out the link to a video by Gordon Ramsey in "tips" for instructions. Let the bread crumb mixture cool until you can handle it and carefully pack it on top of the mustard and garlic covered racks. Liberally pile it on and keep packing it down. You shouldn't have but a tiny bit of bread crumb mixture left. For step-by-step instructions showing how to "french" a rack of lamb, check out this video with Gordon Ramsey. Most racks of lamb are sold two racks to a package and are approximately 2 pounds. Racks of lamb can vary in size. If your racks are much over or under one pound each it will take longer or less time, accordingly, to cook them. To ensure they are cooked to the proper temperature use a meat thermometer. Sharon, this looks fabulous! What a gorgeous presentation for Easter. And the dijon mustard encrusted lamb must have amazing flavors. I love all your photos and your step by step instructions. So helpful. BTW – Happy Easter this weekend!